My twenty-seventh stadium of 2013 was on Monday 25th November 2013 at Parkfield in Potters Bar, Hertfordshire. The match was Potters Bar Town vs. Aylesbury in the Southern League Division One Central. Parkfield is located in the east of the the town and is surrounded by a primary school, housing and a park. It is just over half a mile from Potters Bar railway station. The club were formed in 1960 as Mount Grace Old Scholars and the venue has changed greatly since that time. 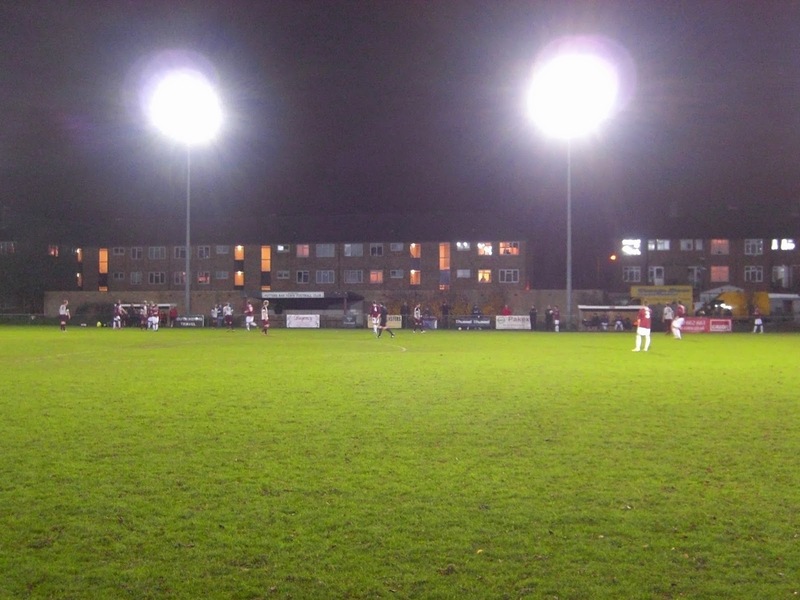 The west side of Parkfield houses a 150-seat structure which was built in 2001 as part of ground improvement works which also included renovations to the clubhouse and dressing rooms which are located close to the stand. 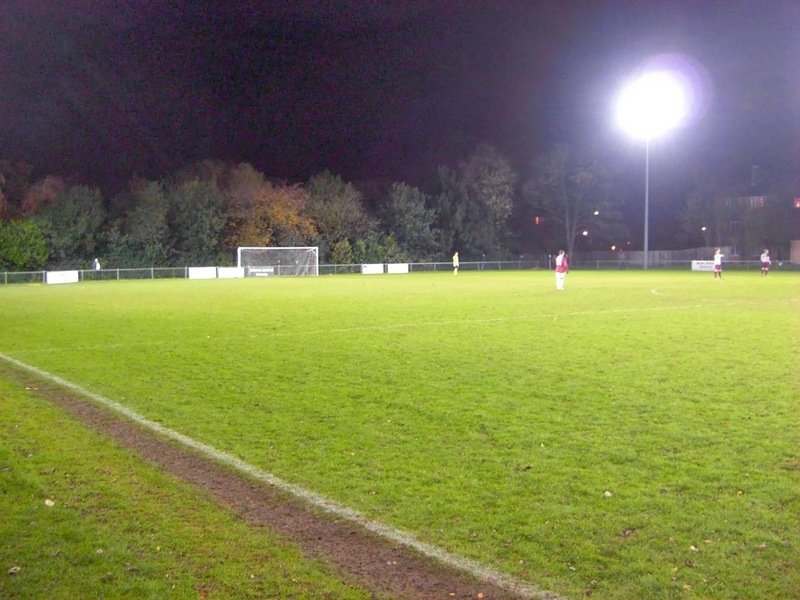 In recent years the club have outlined plans to expand the clubhouse in order to further improve upon the facilities at the Parkfield ground. The rest of the ground includes another two covered stands. 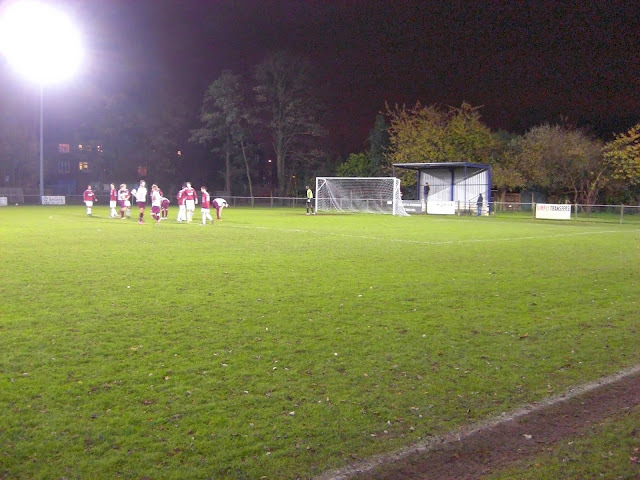 Behind the southern goal there is a corrugated iron structure with a few steps of terracing. This is a very small stand which provides limited cover as it does not have any sides to it. On the east side of the venue there is a brick stand which contains two rows of wooden benches at the front of it. The remainder of the ground is uncovered standing. It only took until the 4th minute for the visitors to open the scoring. The ball was kept in play down the wing and squared for Aston Goss to tab in on the line. 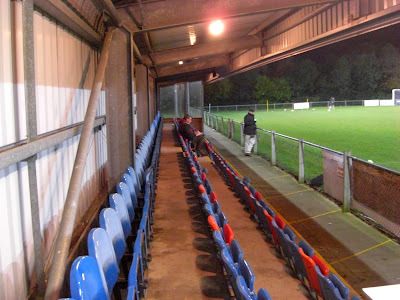 It was a fairly quiet opening 45 minutes though Potters Bar almost equalised shortly before the break when James Ewington curled a 25-yard effort onto the crossbar. Aylesbury began the second half looking to extend their lead but in the 55th minute Potters Bar suddenly fashioned the chance required to level the scores. Cole Penny dinked the ball through for Tobi Akin who beat the back line and lofted the ball over the advancing Aylesbury goalkeeper. Despite their passing football the visitors did not deal with Akin effectively and in the 75th minute he struck again when he connected with Dan Millard's corner. Akin had a good chance just before the end of the 90 minutes to claim his hat-trick but couldn't manage to score so had to be content with a brace as Potters Bar ran out 2-1 winners.